Welcome to Miller, South Dakota! Whether you are a visitor looking for information about Miller, South Dakota and the surrounding area, or you are a resident searching for the latest information about our community, you've come to the right place. This site has information on our local economic development office, the Miller Civic and Commerce Association, and the City of Miller. We also have a community calendar that highlights all of the upcoming events. 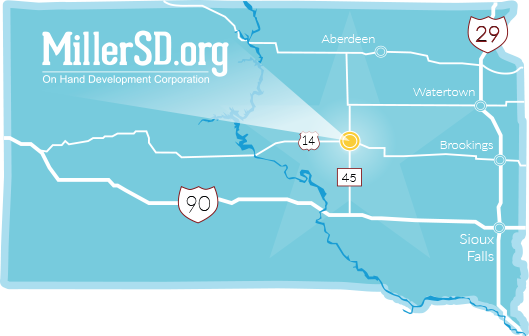 Be sure to visit our Facebook page, follow us on Twitter, or check our blog to interact with others on all topics related to Miller, SD. Thanks for visiting our website - we hope you drop by again soon! Have you had a good experience in a Miller business recently? Click here for the “Caught Doing it Right” Nomination Form! Home - Yes I Am Home!